Dr Jan Sheldon, CEO of Norwich homeless charity St Martins, one of our Surviving Winter appeal partner organisations, discusses the issue of rough sleeping and some of the ways in which the charity is supporting vulnerable people through winter and beyond. For most of us it’s hard to imagine what it’s like to spend a night on the streets knowing that you will be doing the same the next night and the one after that. When I talk to some of the people who use our services about their experiences they talk about fear, feelings of worthlessness and a loss of identity. Having to find somewhere which may or may not be safe to lay your head and try to get a few hours’ sleep and survive a night with temperatures close to freezing sounds like something that was happening hundreds of years ago. Sadly and unforgivably it is happening now, in 21st century Norwich. St Martins is a well established charity founded back in the 1970s. I’m sure our founders and early trustees thought they were solving a problem of their time and didn’t see the charity having a long term future. Today our challenges are greater than they ever were. However hard we work we cannot keep up with the need for care, support and accommodation. Every week we see new people arrive on the streets, usually local people. Often people who have fallen on hard times, exhausted the sofa surfing opportunities and have no other options. Through a combination of unfortunate circumstances, many of which could happen to any of us, they start to sleep on the streets. Some people are quick to criticise, noting the cans and bottles around the sleeping person, but before you jump in to criticise think about a night on the streets. For many of us there would be a need to blot out the pain. How quickly could that need to blot out the pain become an addiction? At St Martins we have an excellent range of services. 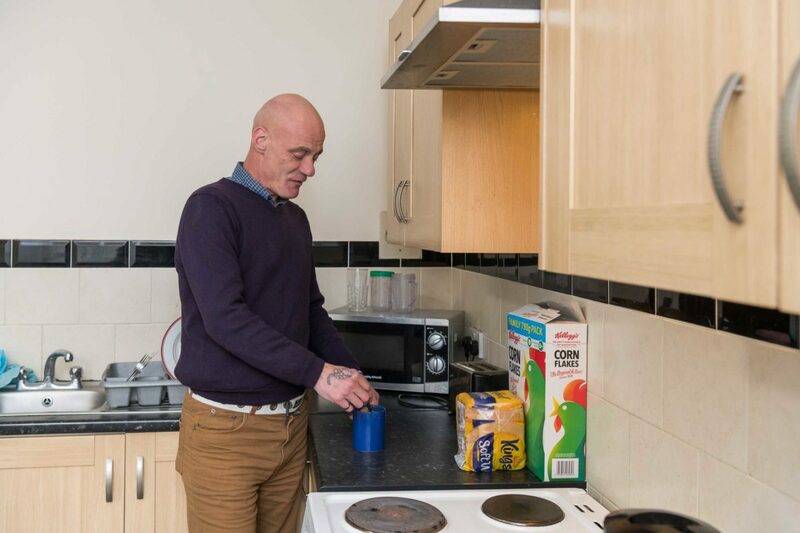 Our Pathways project is a service where, along with six other local organisations, we get out on the streets several times a day to see where our support is needed and how we can help someone into accommodation. Bishopbridge House, our direct access hostel, is often the first place people go to if they need accommodation. We have 37 beds there; it isn’t enough. At Bishopbridge House we get to know the person and we work with them to find a plan to help them to live the life they want to lead. From Bishopbridge House a person could be supported to access accommodation across the city. This accommodation will differ depending on their needs and their age. We also provide learning and development support at Under 1 Roof. This support can range from helping people to prepare for and manage a successful tenancy to opportunities to help them manage their mental health. We also support people in their own homes in order to prevent them from becoming homeless. At any one time St Martins is supporting in the region of 200 people. But still we see people on the streets; our support isn’t enough. During 2019 -2021 we will be embarking upon a new project. Our new Strategic Plan sets out our vision to provide a new 20-bed unit based on the Housing First model. This model recognises that people with very chaotic and complex lives need a different approach. We hope this will make a difference. It is our vision that people who need support and accommodation do not end up rough sleeping. Every night spent rough sleeping is a personal disaster for someone which we want to avoid. Your support will help us to make a difference. The Surviving Winter appeal aims to tackle winter poverty and isolation in Norfolk by providing essential support to some of the most vulnerable through to spring. The aim of the appeal is to reach people who are currently on the edge of formal support but are in serious need. Without urgent help, these people could easily fall into crisis and, for some, the support of charities such as Age UK Norfolk, local foodbanks and St Martin’s Housing could be the difference between life and death.